Desk Report: A red carpet was rolled out to welcome President M Abdul Hamid in Guwahati on Thursday afternoon. President Hamid arrived at Guwahati, Assam as part of his four-day India tour to join the "Founding Conference of the International Solar Alliance (ISA)and Solar Summit - 2018" in New Delhi slated for March 11. 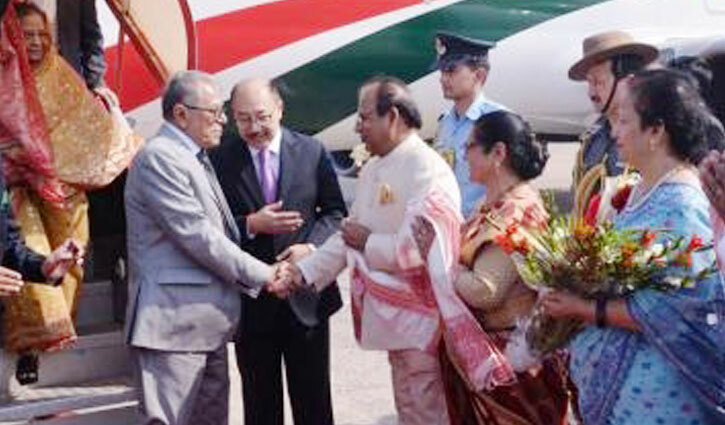 On his arrival at the airport, the President was received by Assamese Governor Jagdish Mukh, Indian High Commissioner to Dhaka, Bangladesh High Commissioner to New Delhi and concerned officials of Indian High Commission of Bangladesh. On Friday morning, the President will leave Guwahati for Balat by a helicopter of Indian Air Force. He is scheduled to visit Tagore's residence in Shilong and Labon in the afternoon.